You all know the flamingo picture that hangs on my wall and my love of Inspirational art so while on the search for the next quote to adorn my living room wall I came across DeeDee&boo. Owner, illustrator and mummy of 2 Helen designs and produces personalised hand drawn prints for a range of different of occasions (weddings, births, christenings & family tree’s) all individual & beautifully styled, but the print that really caught my eye was an ornate heart made up of beautiful purple flowers with the quote ‘She Who Is Brave Is Free’. Being a blogger and putting my work out for the world to judge takes lot’s of bravery on my part and as one day I would love to turn this into my day job to be nearer the kids I asked Helen to add their dates of birth to the artwork so it will remind me on the dark days of why I keep getting up at 5a.m to write. I was pleasantly surprised with how quickly I received my print and how beautifully it was wrapped. It felt like a Charlie & the Chocolate Factory moment unwrapping the golden ticket. The illustration is so crisp and the addition of the kid’s dates of birth made it feel totally unique to me. Another reason I chose this print was in the description Helen gives some interesting facts ”flowers are therapeutic, they make you happier, give you more energy, reduce anxiety and depression all this and still look absolutely beautiful. Who wouldn’t want flowers on their wall?! ” Just looking at the print made me feel calm and relaxed. 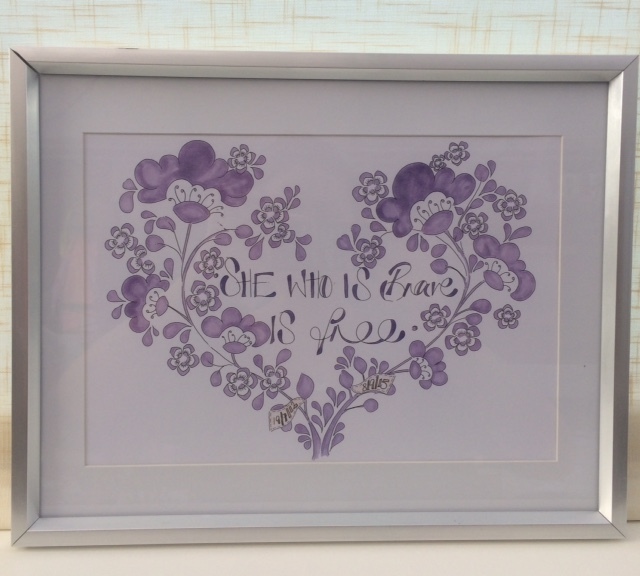 Helen prints all her work on high quality fine art 300gsm paper and you do have the option to add any number of names, dates of birth or messages to the illustrated labels so this could also be the perfect Mother’s Day gift. The prints come unframed so I choose to frame it in a simple silver surround so not to distract from the artwork. Helen’s personalised illustrations start from £20 and she can also be contacted for private commissions too. 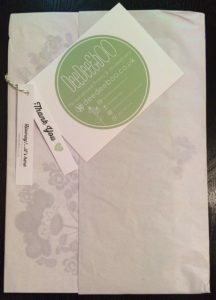 I am in love with my print and would highly recommend DeeDee&boo to anyone looking to purchase a unique gift for a special occasion. *I was given this print for free for the purposes of review but all words and opinions are my own. "Living Arrows 41/52 – A Celebration of Childhood"
Your print is wonderful, thanks for linking up to #AnythingGoes and for sharing this!